Not sure if you need a personal loan? Like lines of credit, personal loans can be used for any purpose, but do work best in certain situations. Struggling with student loan debt or credit card payments? Need to make a big purchase soon or fund an emergency now? The ever-higher cost of higher education has been causing big problems for former college students in recent years. Outstanding debt was recently estimated at $1.3 trillion and federal data shows many are struggling to pay it back, ending up in forbearance, delinquency and default. If you're one of the college graduates struggling to pay back the typical $30,000 to $100,000 in private loans it takes to earn (and finance) a four-year degree, a personal loan may be able to give your monthly budget some breathing room. Many financial institutions are addressing the student loan debt epidemic with longer terms on low-rate personal loans. 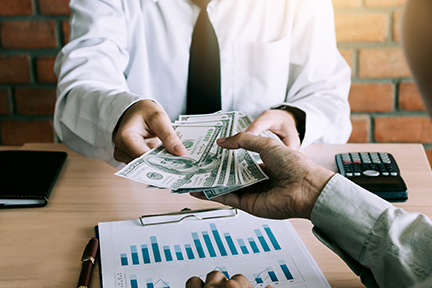 A $40,000 10-year loan with a non-variable annual percentage rate, for example, might be just what you need to lower interest payments and get you on the road to financial stability. Much like a student loan refi, consolidating a large variety of variable APRs into one fixed payment can be a budget saver. Consolidating several lines of credit or cards distills all those monthly statements into one manageable payment plan that can save you money – and your sanity. So, clean out your mail- or inbox and enjoy a more predictable payment that, as an added benefit, will help you knock down the debt faster. What constitutes a big purchase is relative, but let's say you want that snowmobile for the upcoming winter season or a jet ski to improve your summer plans. What about getting the family the latest HDTV as a holiday gift or making someone's birthday extra special? Consider using a personal loan to fund the purchase now and give yourself time to pay it off while enjoying the time-sensitive toy. Personal loans come with flexible terms based on your needs, so you can always pay it off early. Personal loans work best when you know the cost of a repair or essential item. No one likes to deal with emergency expenses, but a recent study shows very few Americans have rainy-day funds. Most banks or credit unions can turn your application around quickly so you can nix the nuisance without saddling yourself with an extra, variable rate line of credit or card you don't otherwise need. Personal loans can put you in a comfortable spot if you're just temporarily short on the cash or waiting on the insurance reimbursement check. Sometimes getting away from it all isn't a simple indulgence. It may very well be a once-in-a-lifetime experience. Maybe you just got the opportunity to finally visit Europe with family and friends or you can't pass up a great deal on overseas travel. Like seasonal recreation and important gifts mentioned earlier, time is of the essence. Don't miss out on priceless memories because you can't afford airfare at a particular moment. A personal loan, with all its perks like low, predictable payments, can get you where you need to go. These are just a few suggestions for personal loan uses. The best part about personal loans is you don't need to have a specific reason to take one out. Use personal loans for any purpose. If you need cash, consider the pros and cons of personal loans vs. lines of credit here. Make your choice and talk with someone at your credit union or bank or apply online for a personal loan or line of credit now to get the process started.